I wanted to like this. I really did. For one thing, I like heist movies. For another, I live for Cate Blanchett. (She does not disappoint in this movie. Her whole look is a mood.) But making this movie as part of the Ocean's franchise was a mistake. 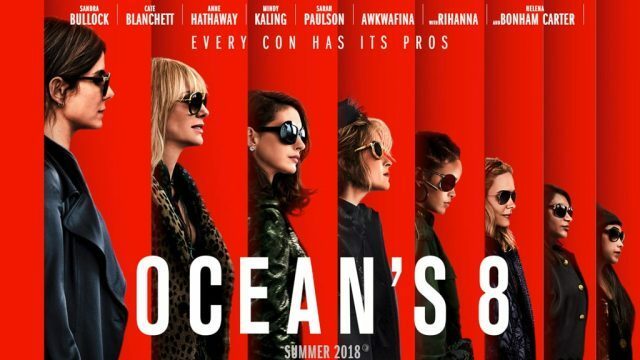 For one thing, isn't everyone sick of the Ocean's movies? I know I am. 11 was great. 12 was terrible. 13 was tolerable. Let it die already! Instead, this movie decides it's important to keep paying tribute to the franchise by way of cameos and constant references to George Clooney. It's maddening. Just let it be a heist movie on its own! It literally adds nothing to the story to make it related to the other movies. I argue it makes it weaker. Secondly, the movie just isn't very good. Like, it tries, but it lacks the both playfulness and drama, leaving the movie rather...bland. Everything just sort of happens. I didn't turn the movie off or anything, but at no point did I feel fully engaged with the story or literally any of the characters. In fact, the best person in the entire story was probably Anne Hathaway, who was the only person to show any depth of character. Everyone else was very one-note. Very. I will add that's probably not the fault of the actors themselves, but the writing. I mean, since when does Helena Bonham Carter struggle to be interesting?!? Anyway, I was hoping for a successful female spin-off/remake/whatever you want to call it to prove the haters wrong, but sadly, this wasn't it. On the other hand, I'm not terribly disappointed at the prospect of letting this "franchise" die a quick death. Try it again, but with a better script.